What if money was not an issue? Would you develop new products or services? Make an acquisition? Accelerate your growth objectives? Take chips off the table? These require a great deal of capital, but there are many financing options to satisfy them. The best option for your situation will depend on the size of your business, state of your industry, objectives for growth, and timeline. Financing is available for privately held businesses that are in five general stages: startup, expansion, growth, stable, and decline. These five stages are not necessarily linear—a business can be stable for several years, then switch to growth stage, which is often the case when making acquisitions. In the startup phase, a business is still building its prototype and often times hasn’t sold product yet. During this time, a business can obtain financing through friends and family, as well as angel investors. This is the riskiest phase, so investors typically invest a smaller dollar amount and will require higher returns that appropriately compensate them for the risk being taken. In the expansion phase, the business has a product (development is complete) and is ready to sell and has some revenue traction. In this stage, the business may access venture capital, but will struggle to access institutional forms of debt. Toward the end of the expansion phase, a business may be able to access bank debt and mezzanine debt. Ongoing cash flows and a clear structure for future performance define the growth stage. During startup and expansion phases, companies’ valuations are based on negotiations which rely heavily on the founders’ vision and forecasts of future performance. In the growth phase, valuations are based on public and transaction comparables, as well as discounted cash flow models (DCF). This phase is the sweet spot for private-equity funds because the funds can maximize returns without taking on too much risk, as one would in earlier stages. A stable company is experiencing steady earnings and is focused on profitability. It’s not experiencing high growth, which makes it a poor choice for growth-equity investors who generally seek to double or triple their investments. This is where strategic investors come into play. Strategic equity investors are typically customers, key suppliers, or other parties who want to mitigate risks associated with a strategic partner—they will make an investment because they rely on the business being solvent. For this reason, they are not as returns-driven as private-equity firms or venture capitalists and their time horizon for return on investment may be much longer. When a business is in decline, financing can be secured through turnaround experts and special-situation funds. These parties are experts in the same industry who believe they have the ability and expertise to turn the company around. While turnaround funds will also typically take an equity stake in the company, unlike a private-equity firm, a special-situation fund will be extremely active, working on day-to-day management and operations in order to improve the company’s performance. The two most significant differences between private equity capital and debt are availability and dilution. 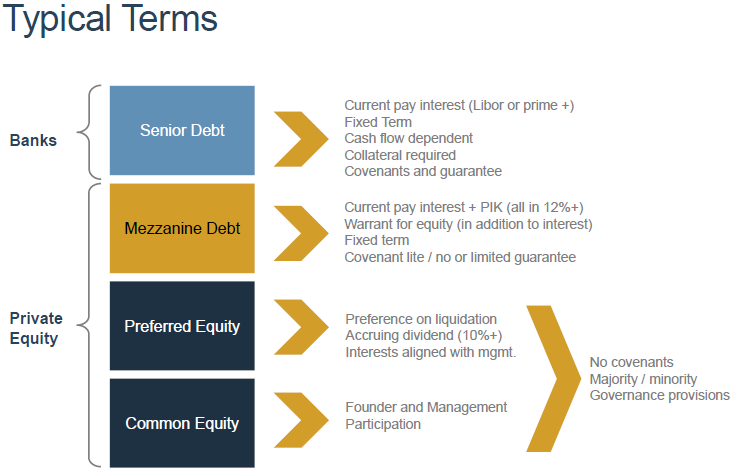 Equity capital is available to startup, expansion, and growth companies; debt is typically only available to late-expansion, growth, and stable companies. Banks issuing debt will be most interested in seeing that a company has cash flow (to service the debt), has a solid balance sheet with sufficient collateral/assets, and has an acceptable amount of leverage (debt-to-equity ratio). Equity providers, on the other hand, will typically be focused on maximizing the value of the company through strategic growth initiatives. Equity investors tend to be more active than debt providers, often times utilizing their resources, industry connections, and expertise to enable the business to expand and become more efficient. Whereas debt providers tend to be secured by the company’s assets, equity providers are typically unsecured and therefore the equity capital provided tends to be a bit more expensive than traditional bank debt. Because equity is dilutive and more expensive for the business owner, it’s best suited to support initiatives that don’t support asset growth, such as opening new locations. For more information on obtaining private equity for a growing company, contact DCA Capital Partners.